And it is no surprise that many Americans drink too much. Beer companies splash their advertising everywhere, sending the message that drinking is a way of life. Starting with the baby boomers, the hard-partying ways of college have percolated through the later decades of life. For many, alcohol represents financial success, leisure and celebration. But it’s not just the heavy drinking you have to worry about. Did you know that even light drinkers aren’t off the hook? No amount of alcohol is completely safe? As it turns out, even light drinking (up to one drink a day), is associated with a risk for cancer in the oropharynx (middle part of the throat) and esophagus, as well as female breast cancer, according to an analysis of more than 200 studies. Alcoholic drinks can contain at least 15 carcinogens (substances that can cause cancer), including arsenic, ethanol, formaldehyde and lead. And the type of alcohol doesn’t generally matter, except when it comes to the esophagus, which is easily damaged by the high concentration of ethanol found in hard liquor, according to findings published on Medscape. What about health benefits of drinking? Many people ask: “Aren’t there health benefits to drinking?” For example, one study demonstrated an association between light-to-moderate alcohol consumption and reduced risk for heart disease in men. 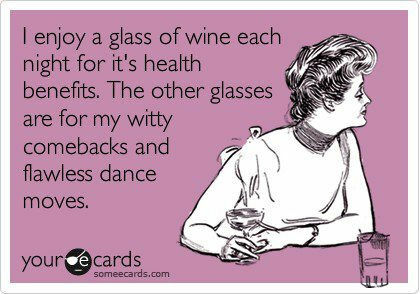 And we’ve all heard about the heart-healthy benefits of antioxidant-rich red wine. Even the National Institute of Alcohol Abuse and Alcoholism acknowledges the research study that predicted there would be thousands more deaths in the U.S. per year from heart attacks if everyone stopped drinking. Unfortunately, studies about the benefits of drinking get far more press than studies about the risks. Too many people have misinterpreted these studies as an excuse to have a beer with lunch, a mimosa with breakfast, and cocktails with dinner. Regard each drink you consume as a carefully weighed risk. Take the motto “less is more” to heart – lower alcohol consumption leads to greater health and longevity. Know your limits and be aware of your alcohol intake. Make it a point to go totally alcohol-free for one to two days each week to ensure your liver has a chance to recover. Discourage your friends from goading each other into consuming drinks they don’t even want. Save the rest of the bottle of wine for another night. Buy the birthday person a book, card or tie instead of a drink. Life is full of pleasures, and alcohol is just one of many. Enjoy Your Healthy Life!